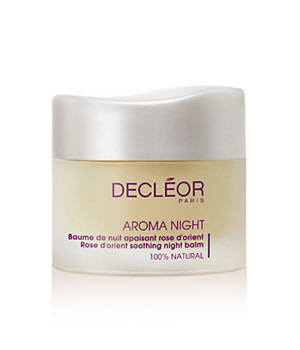 Decleor Aroma Night Rose D'Orient Balm is a 100% natural, preservative free balm, with its lush, melt-in texture, offers all the benefits of a made-to-measure aromatic night-care treatment for sensitive and reactive skin. Its rich, sumptuous texture is easily absorbed by the skin leaving the 100% natural balm to work overnight when your skin is at its most receptive. Active ingredients include calming Neroli and Rose essential oils, Almond to protect against external irritations, Rice Wax to protect and improve skin structure, plus Beeswax to soften. Wake up to softer, smoother skin that feels rested, relaxed and calm once more. With no parabens or preservatives and colorant-free. Suitable for sensitive skin types. The Soothing Collection contains: Aromessence Rose D'Orient Soothing oil serum 5ml, Harmonie Calm Soothing light cream 50ml, Aroma Confort Moisturising body milk 50ml.